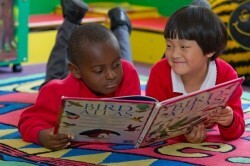 8.45- 8.55am Classroom doors are open for children to arrive and get ready to start the school day promptly. We ask that all parents keep morning messages brief to ensure that children are settled for the register. You are always welcome to make an appointment to speak to teachers at the end of the day. Children are encouraged to be independent from the moment they enter the classroom by organising their own belongings e.g. book bags, coats and lunch boxes. 10.30am Playtime and morning snack. For morning break please provide your child with a small piece of fruit or a vegetable snack. Milk can be provided – see the office to purchase. 11.50am End of morning lessons. ‘Activate’ fitness programme and hand washing ready for lunch. 12-1pm Lunchtime. 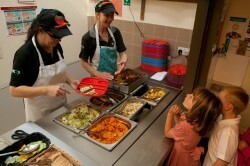 Children may choose yummy school dinners or bring in their own packed lunch. We offer an exciting range of lunchtime clubs which change termly. Every child is encouraged to take part. 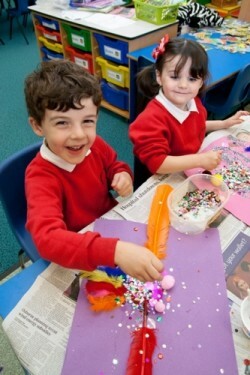 Clubs include options such as; art, gardening, football and recorders. Mid-afternoon. 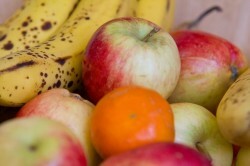 Children are given a free piece of fruit or veg as part of the School Fruit and Vegetable Scheme. 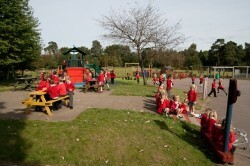 Year R has a set playtime and KS1 often have a ‘Secret Play’ according to the timing of their lessons that day. 3.15pm Please collect your child from their classroom door. Our school has a NUT Free policy.